Do you know how to get to a man’s heart arteries? Bacon. There are a few ways to convince a man to marry you…and while I am sure you can figure out a couple, the biggest one for my husband was bacon. When I want something (hello, new shoes?! ), all I have to do is get up early and make some delicious, thick, center cut bacon…and by that afternoon my feet will be sittin’ pretty in a beautiful new pair of shoes. This trick works because he is either slowly dying from his arteries hardening and can’t catch me, or because I sneak out while he is still face down in his plate of bacon. Either way, it works, and that’s all that matters. Now, how would I top a big plate of bacon? 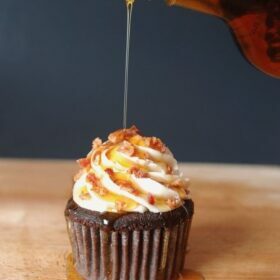 Well, how about a Chocolate Bacon Cupcake with Maple Frosting! 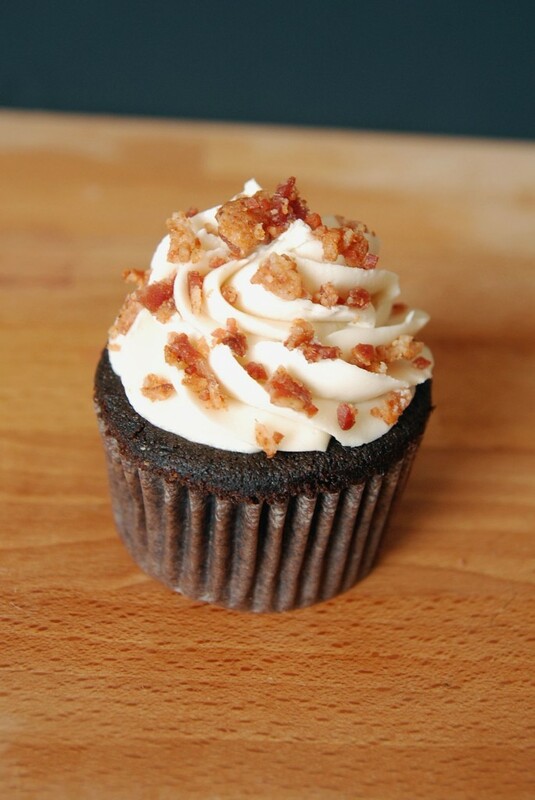 I have been dreaming of a bacon chocolate cupcake ever since the bacon/chocolate trend started. But I was nervous just to jump in with out an idea of what I should do. I have googled recipes…and nothing really stood out to me. But after making the 100 Grand Cupcakes where I used the caramel syrup to make the salted caramel frosting, I knew I finally put the ultimate cupcake together in my head! 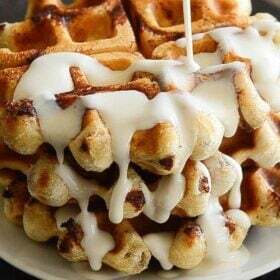 I used that same exact method for the frosting, and substituted pure maple syrup for the caramel! These were amazing and definitely a favorite among the guys! Recipe Notes: There are two important ingredients for this cupcake. First being the bacon, of course. Don't cheat yourself by using turkey bacon...or worse...pre-cooked bacon! Use good, quality bacon. Trust me, it is worth it. And also spend the money and buy the pure maple syrup. I promise you that Aunt Jemima just ain't gonna cut it in this recipe! Preheat oven to 350 degrees. Line standard muffin tins with paper liners. Whisk together cocoa and hot water until smooth. In another bowl, whisk together flour, baking soda, baking powder, and salt. Melt butter with sugar in a saucepan over medium-low heat, stirring to combine. Remove from heat, and pour into a mixing bowl. With an electric mixer on medium-low speed, beat until mixture is cooled, 4 to 5 minutes. Add eggs, one at a time, beating until each is incorporated, scraping down sides of bowl as needed. Add vanilla, then cocoa mixture, and beat until combined. Reduce speed to low. Add flour mixture in two batches, alternating with the sour cream, and beating until just combined after each. Remove from stand mixer and gently fold in bacon. Divide batter evenly among lined cups, filling each three- quarters full. Bake, rotating tins halfway through, until a cake tester inserted in centers comes out clean, about 20 minutes. Transfer tins to wire racks to cool 15 minutes; turn out cupcakes onto racks and let cool completely. Frost as desired. Cream the butter in the bowl of an electric or stand mixer. Add the vanilla extract, salt and pure maple syrup and combine well. Begin adding in the sugar and mixing thoroughly after each addition. After all of the sugar has been added and mixed thoroughly, give it a taste and decide if you want to add in more maple syrup. For thicker frosting you can gradually add in a little more sugar. Garnish with chopped bacon and a drizzle of pure maple syrup if you wish. Bacon on cupcakes? You are a genius! I just woke up and I wish I could eat one of those right now…! I will never ask you to make these for me! Yuck! However, I would enjoy them without the bacon….hopefully one day soon. I’m with you on the bacon. That’s my plan for when I meet my future husband. Just stuff him full of bacon and then get him to agree with whatever I want while he’s still in a stupor. It’s definitely the way to go. Although, with cupcakes this delicious, I just might be in a stupor as well! These sound AMAZING. I don’t know how you come up with these things. Your brain sounds like a really fun place to be. I would love to try one of these cupcakes! 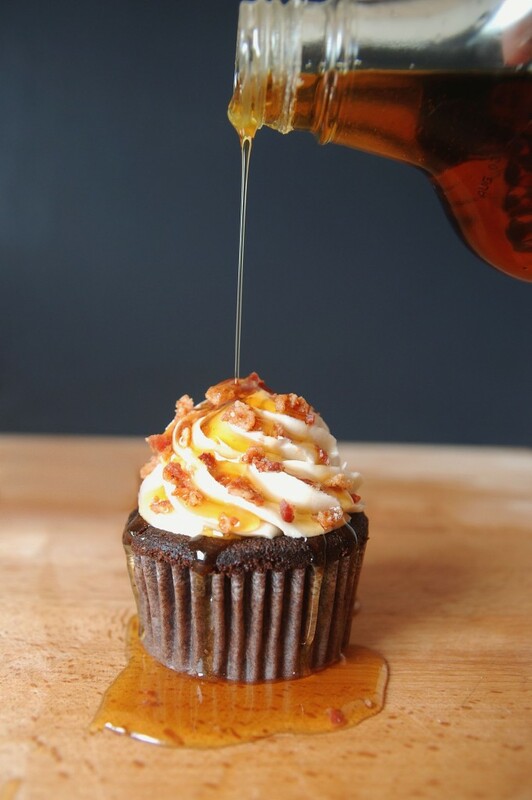 I haven’t quite warmed up to the idea of baking with bacon, but these gorgeous cupcakes just may have convinced me. Love the fact that all you need to do is fry up some bacon if you want something from your hubby, haha! I’d try that, but he’s in charge of breakfast every weekend. These look great, keep on bakin’! Bacon in a cupcake? I’m SOLD! Wow, what a combo and quite the unique cupcake!!! You have no idea how much bacon is the way to a pregnant woman’s heart! I am so excited that I found your blog. I added you to my RSS feed and I can’t wait to read more! Maple, good choice! 😀 These look great! I have a feeling that my life will change forever once I take a bite out of these cupcakes! Amazing!!!!! that 2nd photo looks stellar, not to mention delicious! Initially I was a little skeptical, but after a while I think I would like to try this…a little salt on the chocolate cupcake really started to sound very yummie! Love the photos…awesome! I love this idea! And you are so right about REAL maple syrup. I made a similar attempt a year or so ago with a ‘Hawaiian’ cupcake… with pineapple batter and sliced ham to line the tins. There were people who loved it and people who wondered what on earth I was thinking! As if my husband wasn’t already in love with your cupcakes!! These look fantastic! I love bacon and chocolate, but I just can’t bring myself to try them together yet! I have a friend who is a bacon fanatic who would probably go crazy over these! Um…amazing. Delicious. Perfection – we need these. Oh my gosh, amazing! I just went to the Chicago Bacon Takedown where I had tons of ridiculous bacon stuff (bacon gingersnaps, bacon shortbread, bacon caramel corn, etc.) I have photos and a list of everything here: http://chewonthatblog.com/2010/09/13/the-chicago-bacon-takedown-2/ I wish they had bacon cupcakes 🙁 I feel like I missed out now! I am in the process of making them right now. I’ve done bacon chocolate chip cookies before to great success with my kids. I made these this weekend and they were so delicious. Thanks for the recipe! 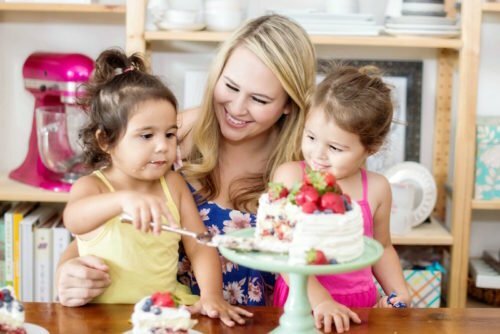 Pingback: The Novice Chef » Healthy or Not Healthy? You are a genius! 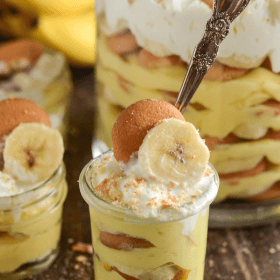 I’m making these this weekend for my fiance’s birthday! Although the bacon cupcakes are delicious, the frosting is for butter lovers only. We had to add more sugar and more maple and then more sugar and more maple to make it edible. And then still decided to toss it. 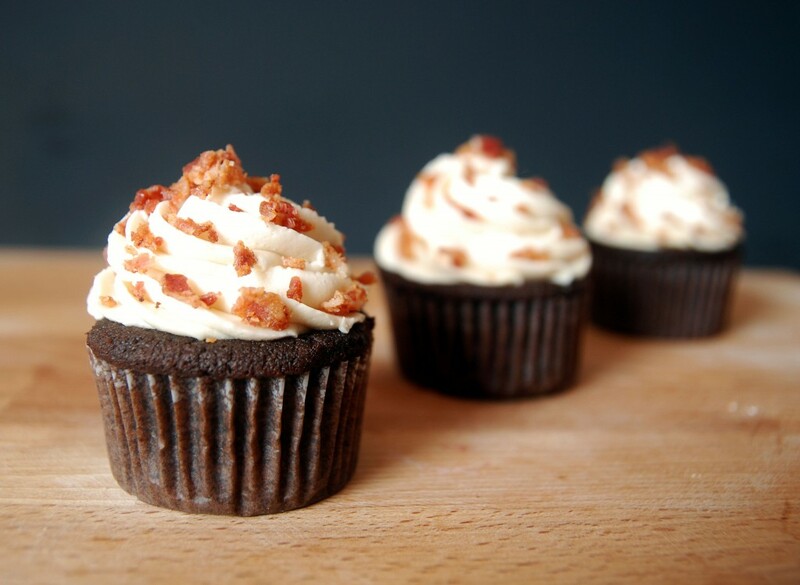 We’ll be enjoying the brilliance of bacon cupcakes, but I would watch out for the frosting. The buttercream recipe is the standard butter to powdered sugar ratio. Sorry it didn’t work for you! Pingback: k-rad - a thousand times rad! I just made these for Thanksgiving, I loved it! The cake is moist and tasty, the frosting is like heaven and the bacon w/ maple syrup drizzled on top…the perfect tie in….thank you! I loved it so much I had to share it!! Thanks for this!!! I just made these cupcakes today, and they are AMAZING! The frosting’s a little sweet but it complements the salty bacon so well. I can’t wait to bring these to my friends tomorrow! What exactly is homemade syrup? 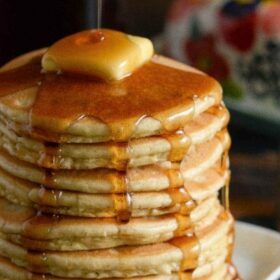 Pure Maple Syrup is extremely different from the regular pancake syrups and has a very different flavor. It is also much thinner. I am assuming that your homemade syrup is equivalent to the traditional pancake syrups…if so, I would not recommend using it. You can buy mini bottles of pure maple syrup though! Places like World Market have mini ones for only a couple dollars! Haha. Your reply made me laugh. I guess, looking back, it was a dumb question. You’re right about the syrup. A few months ago I found this easy recipe to make syrup–basically sugar, water and whatever flavor extract you like. Pretty much a simple syrup with brown sugar and flavoring… I generally use maple extract, but raspberry is good too. Thanks for setting me straight! I’m constantly learning in the kitchen. 🙂 I’ll let you know if (more like when) I try this recipe! These are a winner. Just made them and they blew my highly anticipated PB&J cupcakes out of the water. Thanks Jane! I am so glad you liked them. And you are right, I do need to update the yield!! 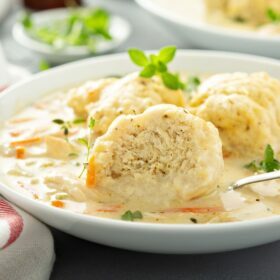 Thought I’d leave a comment to thank you for posting this recipe! These chocolate bacon cupcakes have become a frequently requested dessert amongst my friends for get-togethers! We love them! Though I do have to make a few cupcakes before adding the bacon… for my vegetarian and Muslim friends. LOL! I am making these today and am very excited about it. However, it would be helpful to know how many cupcakes a recipe makes. I’m making them for students who made 80% or better on their algebra test last week, and I need 20 cakes. Is that 1 recipe or 2? I need to know how much to buy. Just a suggestion! Thanks for the recipe! If you look directly below the recipe, it shows the yield is 24 cupcakes. Just made these for my boyfriend’s birthday and they were a big hit! I used maple-smoked bacon and garnished with maple-candied bacon to increase the maple element. I just made a batch of these cupcakes and they are awesome.! Im going to make these again for my graduation party that Im hosting:)<333 THANK YOU NOVICE CHEF!!!!!!!!!!!!!!!!!!!!!!!!!!!!!!!!!!!!!!!!!!!!!!!!!!!!!!!!!!!!!!!!!!!!!!!!!!!!!!!!! Making these for my son a few days before his birthday. Do I need to refrigerator or can they be at room temp? Yes the cupcake recipe was adapted from a Martha Stewart recipe. If you had taken the time to read, you would have seen the credit given at the bottom of the recipe. Do you think I could use turkey bacon instead, with similarly good results? Slowly clogging your husbands arteries just to get new shoes is creative…um, I know, it was all in fun… anyhoo, I love bacon and cupcakes and gooey stuff AND new shoes, so these should be perfect for me.. I will try them! Very nice looking recipe. I actually bought something very similar from The Hummingbird Bakery in London a month or two ago (http://hummingbirdbakery.com/blog/2013/06/tarek-meets-winner-of-emerald-street-cupcake-challenge-susie-kelly/) and I have to say the bacon/frosting combination is perfect. I’ll definitely try this out. Hello, i want to make this, do i need smoked bacon or just cooking bacon? Made these for my husband’s birthday and OMG were they delicious! The cupcake batter was very thick, but when baked the cupcake turned into a sturdy, dense, but not overpowering on the chocolate flavor cupcake. I could only barely taste the bacon, but it was a nice surprise. The next day the bacon flavor was more prominent than when fresh (just fyi). The frosting was sweet! So the added bacon on top was a must to cut through and I did add more salt to the frosting to even out the flavor. Everyone at hubby’s work loved the frosting, a few were hesitant to try a maple, but once they had a bite they were singing praises for it! I actually ran out of frosting and since this recipe made almost 30 cupcakes. I would recommend that you double up the cupcake cups if using paper ones, the bacon grease seeped through the bottom of mine. Overall GREAT cupcake! Thank you!!! I made these today to take to work tomorrow. We’re celebrating the birthdays of two of my male coworkers and I thought bacony chocolate goodness would be genius. Cant believe I did this, but I decided to make half of this recipe. Used half the flour, sugar, cocoa, vanilla etc, but forgot to half the eggs & sour cream. Believe it or not, they turned out just fine. 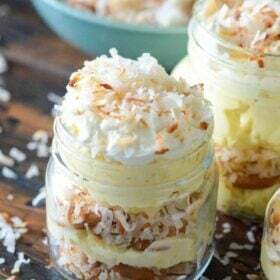 Gonna try and make these tomorrow. Though I will stick to the salted caramel dressing. Not a big fan of maple syrup. Wish me luck! How long and what temp would you recommend if making this into a round cake? My husband has a thing against cupcakes…the horror!! Thank you for the recipe! Just made these cupcakes, they are delicious! I made some candied bacon to sprinkle on top! 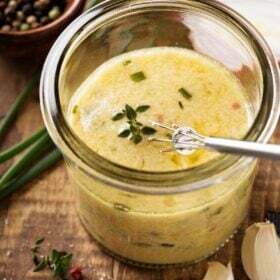 Sorry if this is a silly question, but I am wondering why melt the butter and sugar, how is different from creaming the butter and sugar? Thanks again! About what size should the cupcakes end up being?